SpaceX aims to launch its next mission, the 50th flight of a Falcon 9 rocket, just after midnight Tuesday from Cape Canaveral with a commercial communications satellite for Hispasat. The two-hour launch window opens at 12:33 a.m. EST (0533 GMT). The Hispasat 30W-6 telecom craft will ride a 229-foot-tall (70-meter) Falcon 9 rocket from the Complex 40 launch pad at Cape Canaveral Air Force Station. The commercial mission was supposed to lift off last month, but SpaceX delayed the flight to complete additional testing on a pressurization system on the Falcon 9’s payload fairing, the shroud that will shield the Hispasat 30W-6 satellite during the first few minutes of launch. SpaceX said earlier this week that the pressurization system concern was resolved, but United Launch Alliance had Thursday and Friday reserved on the U.S. Air Force’s Eastern Range for an Atlas 5 mission with a NOAA weather satellite. SpaceX requested a launch opportunity from the Air Force for early Thursday, around 16-and-a-half hours before the Atlas 5 launch. The Air Force was prepared to support both launches Thursday, a rapid same-day turnaround capability not demonstrated at Cape Canaveral in nearly 40 years. But ULA and NASA officials, which had responsibility for launching the NOAA weather satellite, were concerned the Atlas 5 rocket and sensitive optics on its GOES-S meteorological payload would be exposed to the Falcon 9’s exhaust plume as it fired into space. The Atlas 5 and Falcon 9 pads are located about a mile-and-a-half apart at Cape Canaveral, and both facilities are built with a “clean pad” design without a protective gantry to protect rockets after they roll out in preparation for liftoff. Officials were also studying whether the Atlas 5 and the GOES-S weather satellite might be endangered by a potential mishap during the Falcon 9 launch. SpaceX ultimately delayed the Hispasat flight to Tuesday, and a drone ship expected to recover the Falcon 9’s first stage booster returned to Port Canaveral, presumably for rest and refueling before heading back out to sea ahead of next week’s mission. The Atlas 5 rocket successfully delivered the GOES-S weather satellite to orbit Thursday. 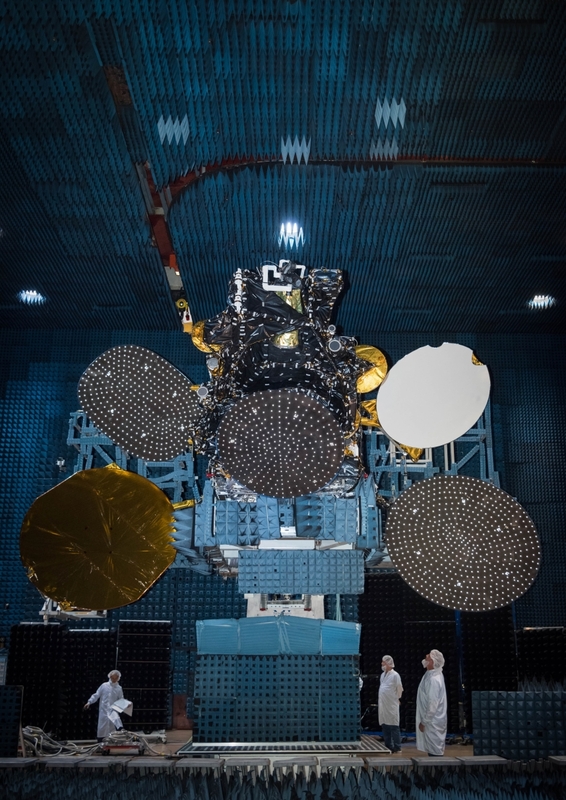 The Hispasat 30W-6 communications satellite awaiting launch on the Falcon 9 rocket is a Spanish-owned commercial video, data and broadband relay craft heading for a perch in geostationary orbit more than 22,000 miles (nearly 36,000 kilometers) over the equator. Built by SSL in Palo Alto, California, Hispasat 30W-6 will replace an aging telecom satellite launched from Cape Canaveral in September 2002 aboard an Atlas 2AS booster. Its telecom payload will serve customers in Spain, other parts of Europe, North Africa and Latin America. The weather outlook for Tuesday is favorable, with a 90 percent probability of conditions acceptable for liftoff. The only slight concern is with thick clouds, but mostly clear skies are expected, with east-southeast winds of 10 to 15 mph, and a temperature of 60 degrees Fahrenheit, according to the official weather outlook issued Saturday by the Air Force’s 45th Space Wing.